Hidden Forces: some participant observations of an artist residency in Llandudno by Frances Williams. This research was commissioned by Peabody Housing Association to inform their arts and culture development and programming. The survey employed an inclusive and broad definition of ‘arts and cultural activities’ encompassing ‘everyday culture.’ Available here. with the antagonisms that are integral to collaboration. and the Parental Mental Health Team. 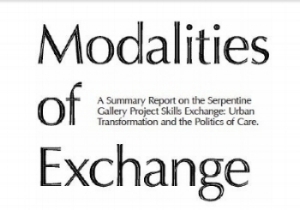 Skills exchange was a collaborative art and social exchange research project that took place between January 2007 and April 2012. Through 5 embedded multi-year residencies, Skills exchange tested the idea that isolation and discrimination are best addressed if artists, older people, care workers and others exchange their skills on equal ground, altering roles, representations and and well rehearsed relations through processes of creative exchange. The Creative Collisions and Critical Conversations Workshop provided an opportunity for a much needed vibrant exchange between professionals working at the interface between the arts and mental health in a ‘creative collision’ to identify ways delivering of arts/mental health interventions with energy and creativity. It was designed to develop a shared sense of purpose and the recognition that arts practice not only improves ‘patient management’ but also make a valuable contribution to the education and training of health practitioners. Future Stages is an arts intervention programme developed and delivered byOvalhouse, funded by the Paul Hamlyn Foundation (from2012 – 2015), KPMG Foundation and the Equitable Charitable in order to support young people deemed‘at risk’. Drawing on arts participation practice, underpinned by the theory of leading practitioners such as Augusto Boal and Dorothy Heathcote, the programme offers young people opportunities to develop the resilience and skills needed to break the cycle of deprivation and exclusion many of them face in their lives. The Curating Community Workshop developed out of an interest in urban regeneration, cultural policy and participatory art. It drew on the extensive experience in developing, delivering and evaluating community interventions that span participatory arts. The Workshop brought together artists, commissioners, researchers, educationalists and practitioners from community development and from a range of arts practices including community art, socially engaged art practice, participatory theatre and participatory arts. The participants critiqued the ideological presuppositions which often assist participatory art.